The Genealogy Series: The Plummer’s Of The Weald: A Butler And A Gentleman. I admit, I have been a bit distracted lately. Life has taken over and it has been very hectic, which has interrupted any hopes of completing crafting projects. In the midst of all the chaos, I made a huge break through when it comes to my British ancestry. Through various Google searches, I discovered a website called The Weald. The Weald is named after an area in England, South of London that encompasses the counties of Sussex, Hampshire, Kent and Surrey. The website focuses on this heavily forested, historic area and includes genealogical information on British families from the region. 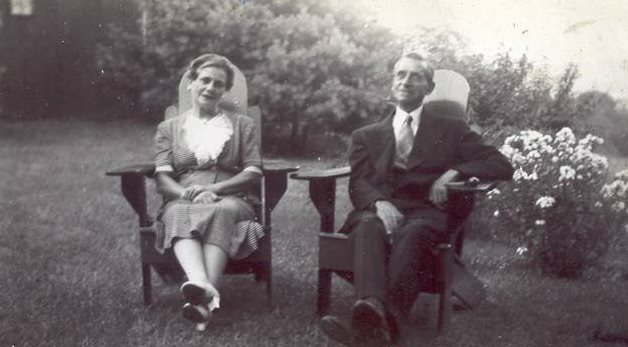 I reached out to the webmaster via e-mail and he was gracious enough to provide information on relatives going back several generations for the surnames Plummer and Long. Both of my families surnames originated in the Sussex area. Today, I focus on the Plummer surname and family line. The Plummer’s originated in ancient Anglo-Saxon culture. It was a surname originally bestowed upon someone who worked with Plumes, or feathers. It is my Great-Grandmother’s maiden name on my Mother’s Father’s side of the family. 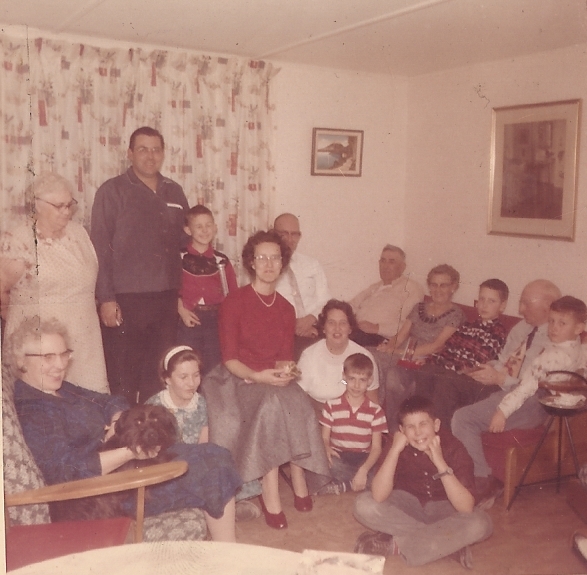 There are very few items around our house that I would call “priceless” As a family historian there is nothing more precious than old family pictures, and documents. One of the most precious documents is my great-grandfather and great grandmother’s wedding certificate and photo album. My great-grandparents married in The Christ Church in Tunbridge Wells in November of 1905. 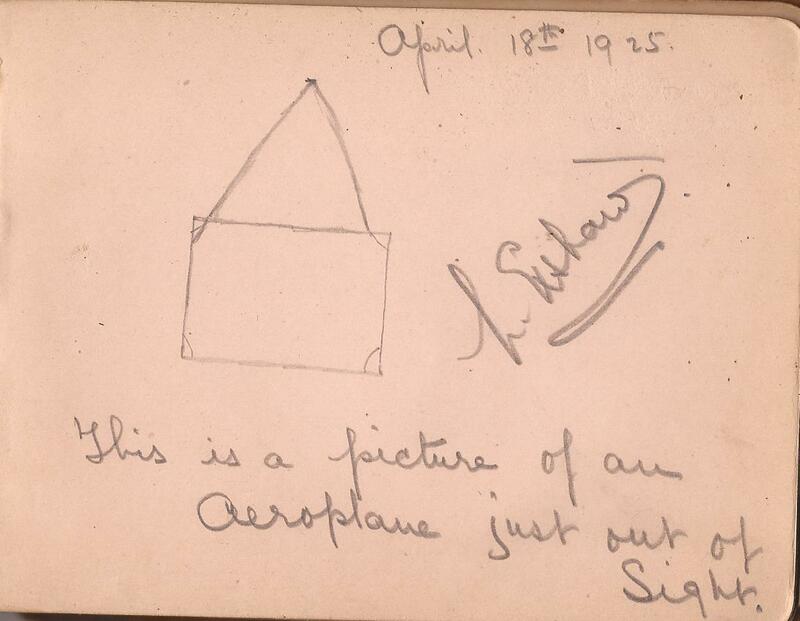 This document was passed down in my family and offered many clues that helped me get started with my family research. It listed the names of my Great, Great Grandfather’s and their occupations. Henry Long a Coachman and William Plummer a butler. William Plummer was born in about 1835 in Shottisham, Norfolk England to parents William Plummer Sr, and Mary Plummer (Maiden name currently unknown) Not much is known regarding William’s childhood. On November 1, 1859 he married Martha Flood in Norfolk, England. They went on to have 12 children: William, Laura, Maria, James, John, Ruth, George, Benjamin, Ellen, Ethel, Alice, and Daisy. William supported a rather large family as a butler. In England wealthy and even some middle class families had servants. The butler was the most prestigious occupation among servants and was often considered a position of “respect”. 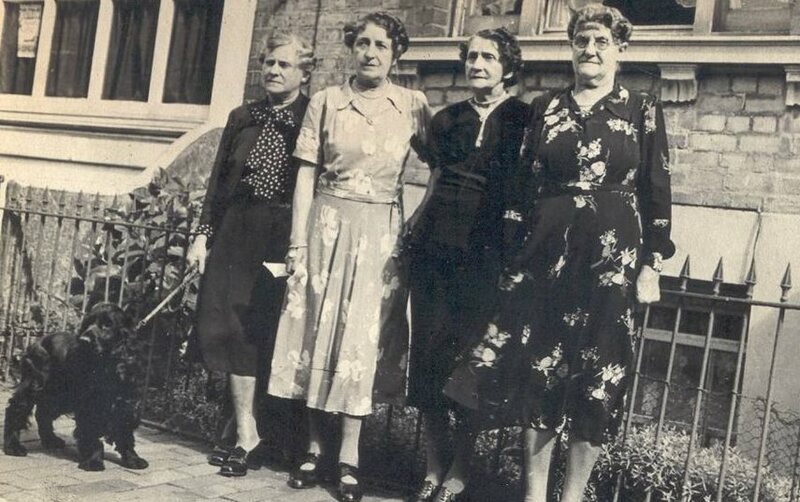 Although the traditional role of butler was to tend to the wine cellar, they had many other responsibilities around the household and oversaw the Servant staff. Traditionally the butler and master had a solid relationship and friendship, and would often share a drink at the end of the evening. The butler was the most trusted of all household servants and carried the most responsibility. In many cases, entering a life of servitude was a decent opportunity for the working man in England due to the class system. Servants if placed in the correct household, had decent living accommodations not otherwise afforded to the common man. As with many instances in England at the time, a hierarchy even existed among servants with the roles of butler and coachman among the most prestigious. According to the 1881 English Census, William Plummer and his family lived at The Priory on Parsonage lane in Lamberhurst The property was owned by Arthur M. Brookfield, a war hero, diplomat, and author. 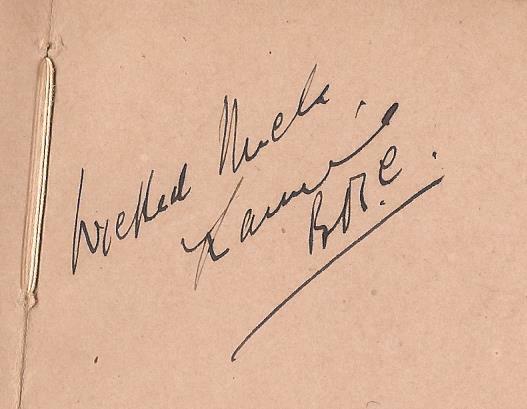 He was also a conservative politician who sat in the House of Commons from 1885 to 1903. My great-grandmother Daisy was born soon after the 1881 English Census was taken, in December 1882. 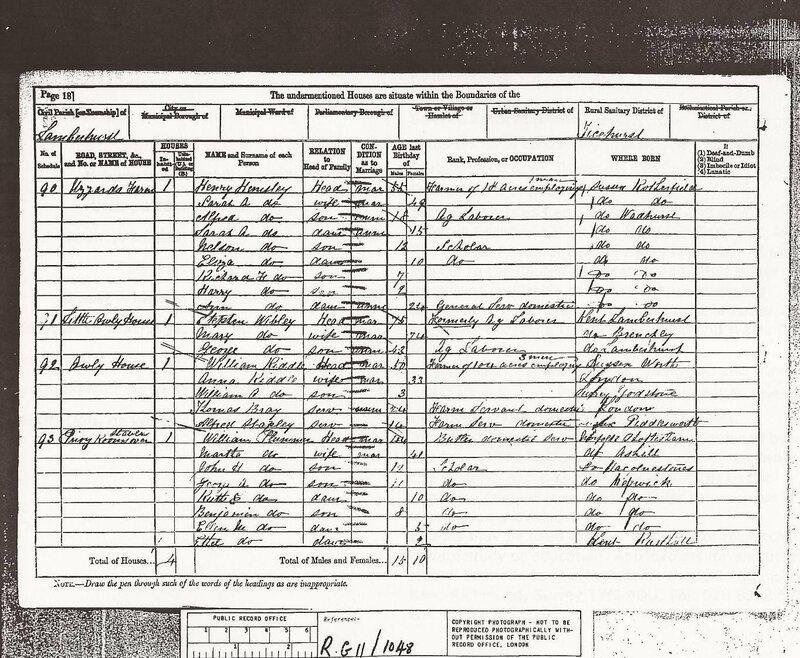 Pictured above the 1881 English Census featuring the Plummer family residing at The Priory in Lamberhurst, England. 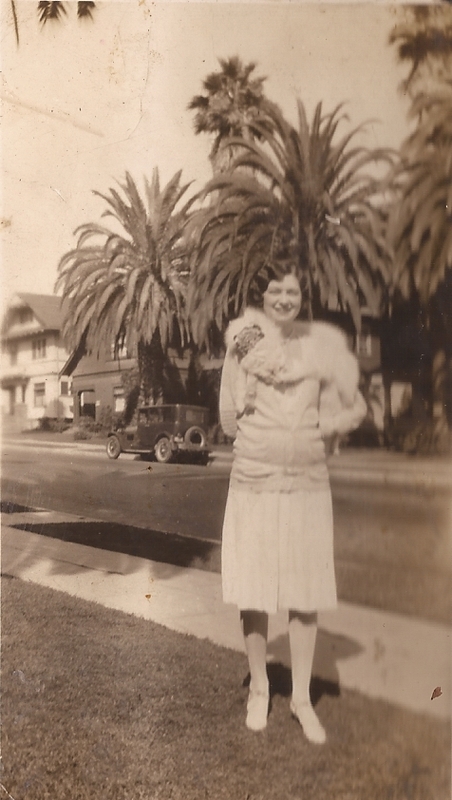 My Great Grandmother was close to her brother John and her sister’s. 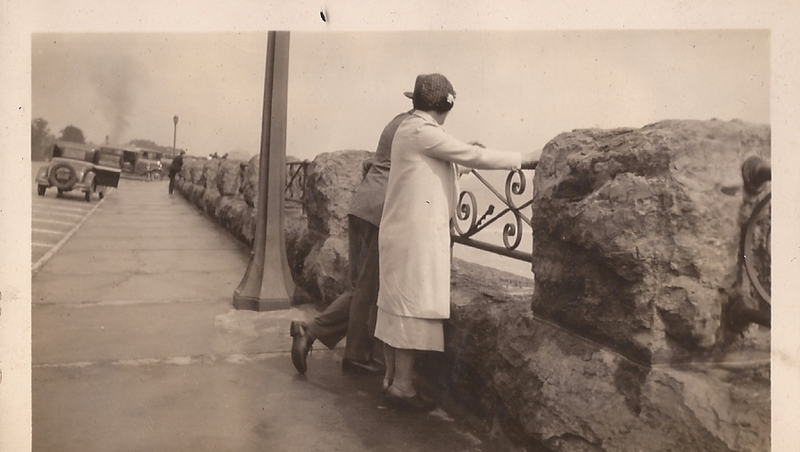 Even after immigrating with her husband Harry Long, an electrical engineer and family in 1925, she still visited England regularly. My Great Grandmother lived to be over 100 years-old and resided in Vermont during her later years and is said to be buried there. I remember her son Vincent (my grandfather) showing me a form letter from then president Ronald Reagan, congratulating his mother Daisy for living past the age of one hundred. 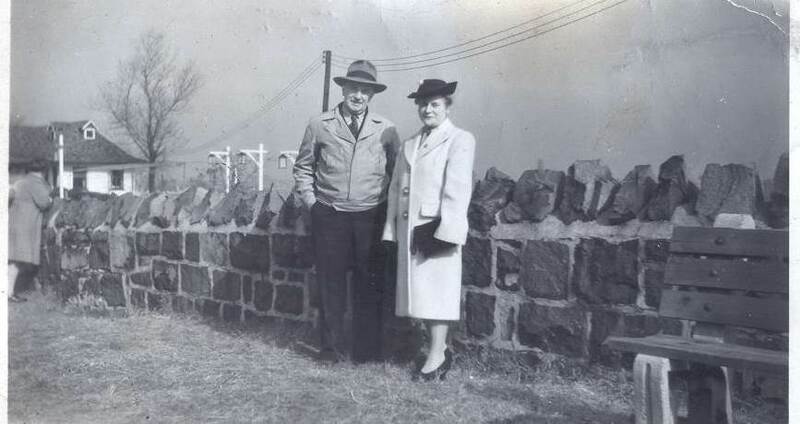 Harry Long her husband passed away in 1946 from a heart attack while on their way to their vacation home in Putney, Vermont and is buried with his daughter Eva Long in Englewood, New Jersey. 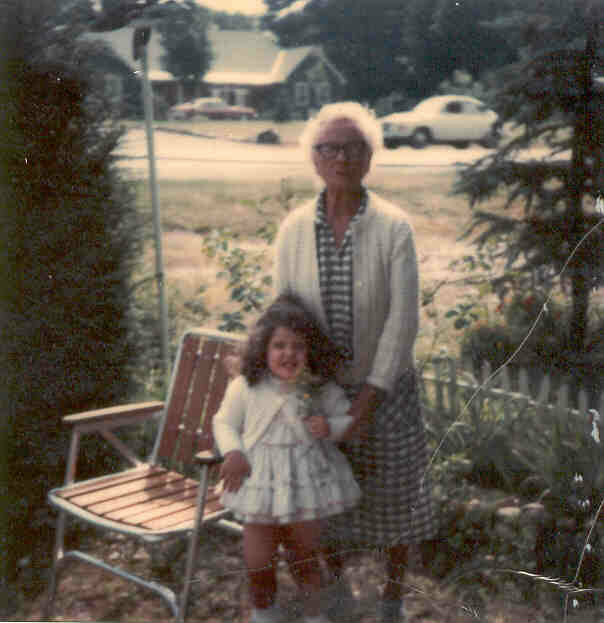 Pictured Below: The only picture that exists of my great-grandmother Daisy (Plummer) Long and me. Taken when I was 3 years-old in 1978 Vermont. I actually have some memory of this day. What was your biggest family research break through? Have you had success researching your British ancestors? 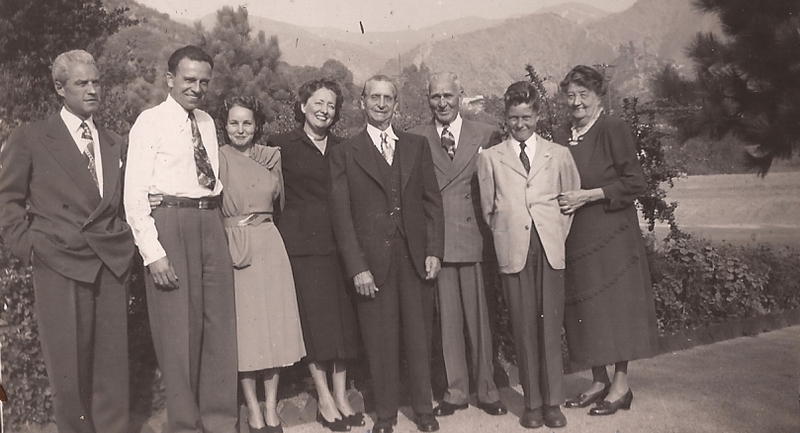 What was your greatest family discovery? 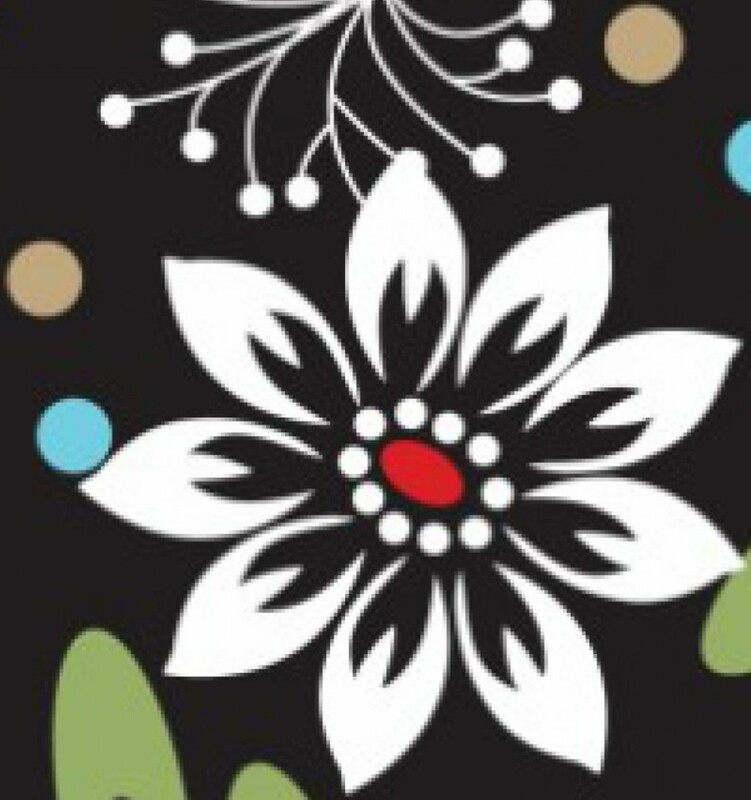 My First Conference: 2013 Mid Atlantic Genealogy Conference Wrap Up. Yesterday, I attended my first Genealogy conference and it was packed with information! It was hosted by the LDS Church and admission was free! It was an all day event 8:30 am to 4:30 pm. I took advantage of some of the classes offered such as Irish genealogy, Immigration, Forensic Genealogy as well as local record resources, (Just to name a few!) Many classes offered handouts with great informational website links. 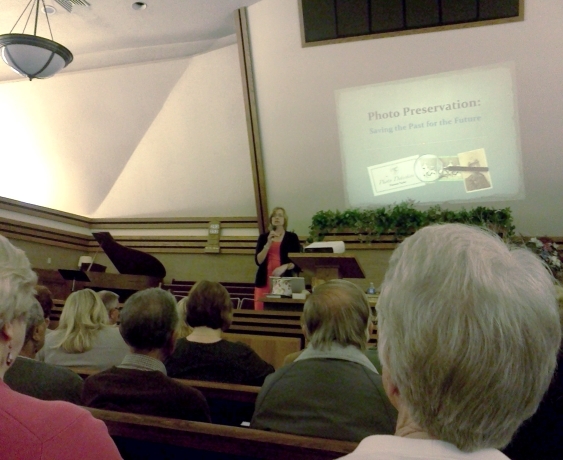 Vintage photo expert Maureen Taylor gave the key-note address on photo preservation and disaster preparedness planning for your priceless photos. An especially important point due to recent local catastrophe’s such as Super Storm Sandy. My favorite part of the show hands down was the New Jersey Chapter of The “Genealogy Roadshow” PBS airs a new show by the same name and it based on a similar premise. On this day It allows the opportunity to sit with a professional Genealogist for 15 minutes to discuss a piece of research that is stumping you. 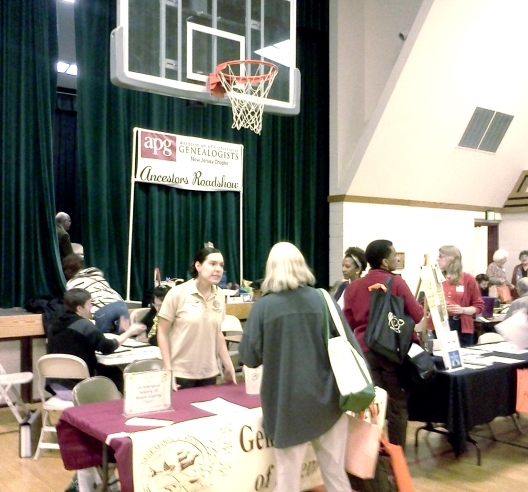 I eagerly waited in line and enjoyed a conversation with a fellow genealogist as eager to get an appointment as I was! Due to child care issues my husband stayed back and watched the little one so I could attend, but I had to go alone. The great thing about those interested in Genealogy is they are friendly and eager to share information with you. I talked to a lot of great people who are passionate about family research! I booked my appointment and returned at 12:15 to sit with Rich Venezia a Professional genealogist in the New Jersey area. I brought to him just one of my biggest road blocks: The elusive Uncle Ted. 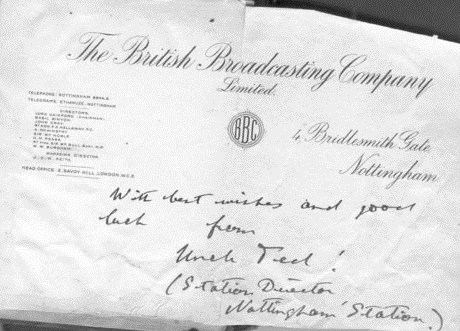 It was rumored on my maternal grandfather’s side that an uncle worked for the BBC when it was first founded in 1922 as the Station Director in Nottingham England. 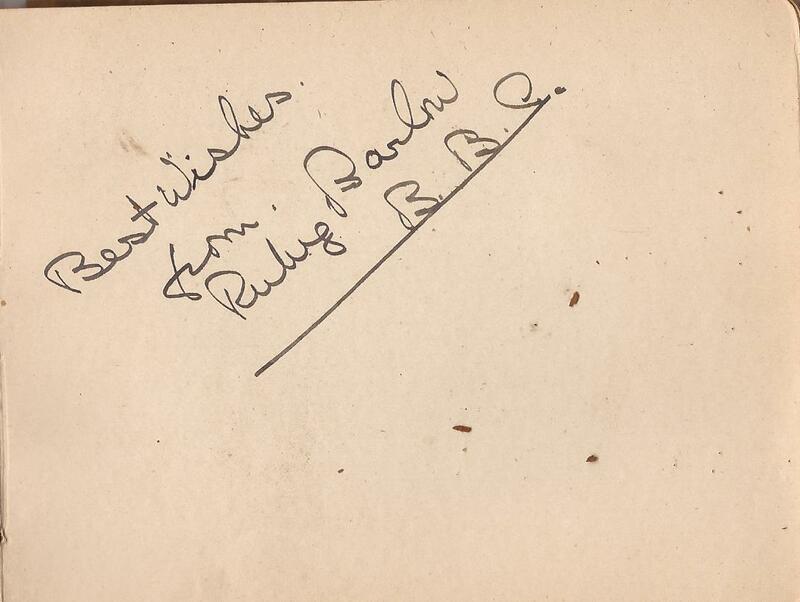 Inside my Great Aunt’s autograph book is a BBC document on letter head signed by “Uncle Ted” right before she sailed to the United States in 1925. I haven’t been able to confirm uncle Ted is an actual uncle as I have never been able to link him to either side of the family. He suggested an interesting concept I hadn’t thought of before: Research the neighbors and try to find clues. He also suggested I contact someone in the BBC (I had tried before and had no such luck) because he believes someone such as a BBC historian would be interested in such a document and historical information. 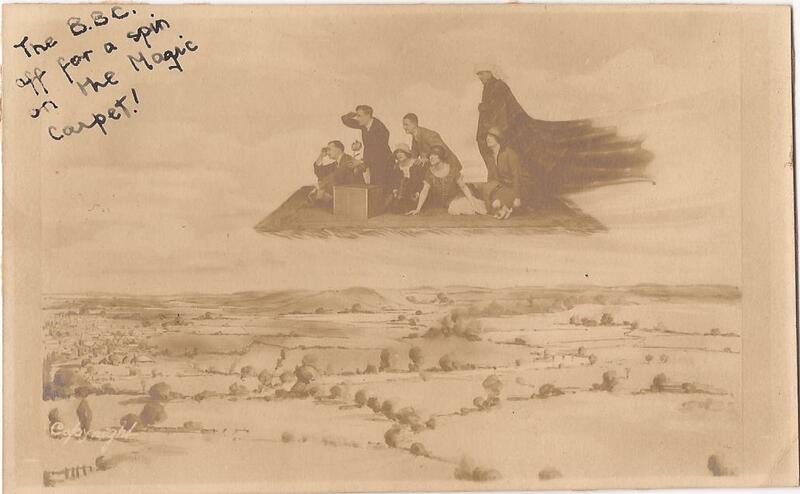 I also have an unknown photograph of the BBC Riding the “Magic Carpet” I am assuming this is referring to a radio show at the time. As luck would have it, this morning I came across a BBC Historical site seeking artifacts from BBC history, I jumped at the chance and sent an e-mail with information. Fingers Crossed! Here are some great Informational websites for genealogy research I learned of at the conference. 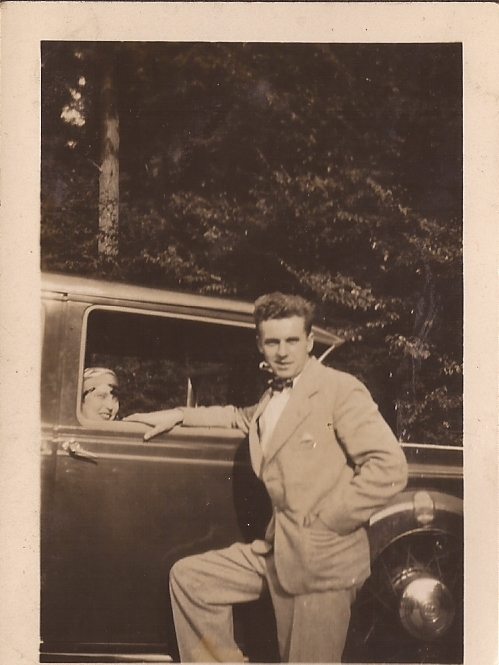 http://www.italiangen.org/ If you are interested in researching family members who lived in any of the five New York boroughs this is the site for you! Wish me luck as I am going thrifting today! 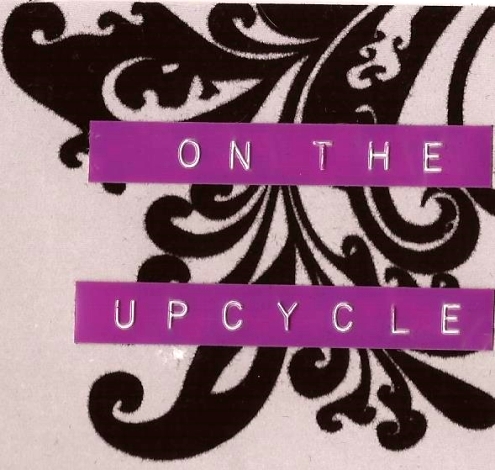 I have been “striking out” lately on finding good Upcycle candidates, but am hoping my luck will turn around today! Enjoy the rest of your weekend my lovely readers!